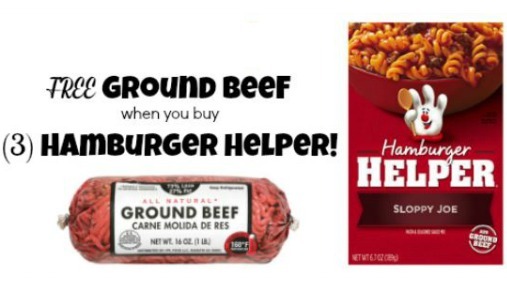 Home > Printable Coupons > Hamburger Helper Rebate | FREE Ground Beef! Hamburger Helper Rebate | FREE Ground Beef! The Hamburger Helper rebate is back! Get FREE Ground Beef when you buy (3) boxes of Hamburger Helper. Combine the Hamburger Helper rebate with a Hamburger Helper Coupon to save more! Note: the ground beef must be valued at $6.92 or less. Go ahead and print these coupons because they won’t last long! Stores will often have Hamburger Helper on sale as low as $1, so you can get some great deals plus FREE ground beef!